The other day I found myself with a whole lot of big ruby red tomatoes, and I just could not wait to make a beautiful panzanella salad. It's June! And I planned to celebrate accordingly with a meal featuring some bright, summertime fare. Mother Nature, however, had other plans in mind. I woke up to rain, wind, and gray the next day, 46 degrees and dropping. It's June, I thought to myself. What the heck?! I really shouldn't be surprised by the crazy weather patterns of the Northeast at this point. I've experienced April in Vermont, sunny and 65 one day with a snow squall the next. But, true to my roots, the San Diegan in me is consistently surprised by anything other than sunshine. While I'll never turn my nose up at a nice day, there's always been something about a chilly and gray day that I've loved. They're so rare back home, and my mom would sometimes fill them with homemade chicken soup, my dad baking up his sourdough bread to enjoy as well. So, with a bunch of big, beautiful tomatoes and a fresh loaf of grainy bread on my kitchen counter, the answer felt obvious. I was craving some coziness, and wanted to make something simple and satisfying, something that would warm me up from the inside out. This soup is all of those things and much more. It's got just the right amount of acidity and texture, and can easily be made even richer with a splash of cream. Within minutes I felt warmed up and happy as a clam, enjoying this roasted tomato soup with one of my favorite humans. 1.25 lbs ripe tomatoes (~4 large tomatoes), quartered - *use local tomatoes if possible, I promise they're tastier! Cut the tomatoes and onion into wedges. Spread out on a rimmed baking sheet and drizzle with the olive oil. Sprinkle with salt, lots of pepper, and chopped sage. Gently toss the tomatoes and onion with your hands to coat evenly. A trick I recently learned - tuck the garlic cloves into the tomato wedges so they soften but don't burn (thanks Sprouted Kitchen!) Roast for roughly 30 minutes or until the tomatoes have blistered, broken down, and reduced to about half their size. Remove and let cool for just a few minutes. 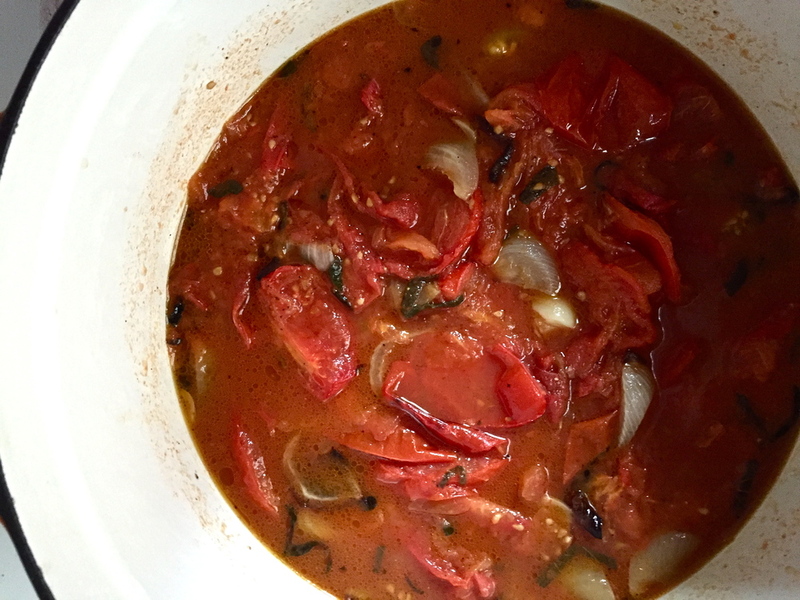 Warm the broth in a large pot, stirring in the tomato paste until dissolved. Add your roasted ingredients to the pot and let simmer for 5 - 10 minutes. Use an immersion blender to puree the soup, or blend in batches using a food processor or blender. The soup should be smooth but textured. Return it back to the pot, and if desired, add the cream to taste. To be honest, I didn't use any cream in this batch and it tasted plenty rich and satisfying. The cheesy crostini felt decadent and delicious in it's place. Add salt and/or pepper to taste. Enjoy with a crispy grilled cheese sandwich, some toasted bread, or broil a few slices with a piece of sharp cheddar or mozzarella on top. Finish with fresh chopped basil and be well :).